Remarks: Power on & power off stalls. The logbook entry gives no indication that this flight was a pivotal moment in my flight training. I had 424 hours in powered aircraft and some glider time as well. However, most of those hours were quality hours. 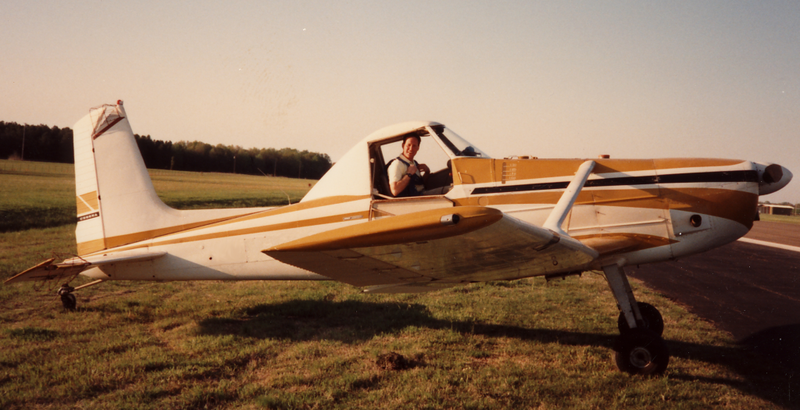 I had my commercial single, multiengine, and glider ratings. My weekends were spent flying, and my vacations were centered around aerobatic training at various schools around the country. While working for the College of Veterinary Medicine at a small southern university, I managed to get an unpaid job as a maintenance pilot and tow plane pilot for the Flight Research Laboratory. The Research Lab graciously allowed one of their aircraft, a Cessna C-319 (Bird dog), to be used as a tow plane for the university glider club. They also decided to put a Cessna C-188 Agwagon into service as a glider tow plane, subscribing to the theory that there is nothing worse for an airplane than letting it sit unused. An Agwagon has top-mounted wing struts, and according to the placards, the aerodynamics are critical. You are not even supposed to fly the aircraft if a strut fairing is absent. But this [experimental] Agwagon was a mess. It had all kinds of stuff bristling off the left wing. The plane had been used extensively at one time for research on guided munitions. The chemical tank had been removed and a seat had been made in the hopper for an engineer. There was a winch on the belly to attach the bomb or rocket. A camera was mounted in a pod on the end of the left wing. Another pod mounted on the left wing strut housed an altimeter and airspeed indicator that the pilotcould see while in flight. The missile would be lowered from the winch while in flight, and the flight test engineer in the hopper would gather flight data. The previous day I had received my orientation on the single-place Agwagon. I had made a brief flight and several take-offs and landings. Today, the test pilot for the research lab told me to do some power-on stalls, power-off stalls, steep turns, and slow flight to become more familiar with the plane before I towed gliders with it. It was a warm muggy day, so I climbed to 7,500 feet where it was cooler. It didn’t take long for the stripped-down agplane to get to that altitude with its 300 hp Continental IO-520D engine. Then it was time for power-on stalls. Power-on stalls for me always meant FULL POWER, or it didn’t count. “Go big or go home” wasn’t in popular use yet. So I setup for a power-on stall. With the throttle full forward, I pitched up to bleed off airspeed for the stall. As the Agwagon slowed I was impressed with how much right rudder I needed to keep the nose straight with that big engine. The spoiled aerodynamics caused by the pods on the left wing created an additional need for right rudder. Thinking back, the removed chemical tank from up front, and the weight of the winch on the belly beneath me, probably put the center-of-gravity near the aft end of the flight envelope. This further decreased rudder effectiveness. I guess it should come as no surprise that I reached the power-on stall with no right rudder remaining to counteract the torque of the snarling, 300 hp engine. The left wing dropped smartly and we snapped over-the-top into a spin. Believe it or not, I was still having fun at this moment. My primary flight instructor had signed me off to do spins in his Cessnas shortly after solo. And, I had continued to practice spins in a variety of aircraft. Once, I even did spins at night (WARNING – do not do this! Really, I mean it!) But, I digress. Being the ace pilot that I was, I pulled the power back to idle, verified neutral ailerons, kept the right rudder to the firewall, and moved the stick forward to neutral. Guess what? We were STILL spinning, and the spin rate wasn’t even slowing! This was something that had never happened to me before… planes are supposed to respond. I was wearing a parachute, as was the policy in all of the research aircraft, and I quickly came to the realization that I was going to have to bail out. Although dropping rapidly, I was still had some altitude left, so I kept in the anti-spin controls and went through a mental checklist: I need to pull off my headset, undo my lap belt and shoulder harness, open the right window, jump over the side, look for ripcord, and PULL. OK… time to go! After mentally making the decision to jump, I looked up and noticed the spin rotation was slowing. I wish I could tell you how many turns I made before recovery, but all that was lost in the adrenalin-fueled, time-compressed memories of the event. After the spin recovery, I climbed back to altitude and tried several power-off stalls. I guess I felt I needed to get “back on the horse.” Even with the power-off stalls, I couldn’t keep the left wing from dropping sharply at the stall break. I came back to the airport and did a few landings. I sheepishly told the test pilot of my experience after I secured the aircraft. He was a little incredulous that I had even attempted the stalls with full power. I heard later that the test pilot took the Agwagon out later the same week to explore its aerodynamics. He never told me what he discovered. I did hear second-hand about the left wing dropping on a slightly high “stall landing.” Apparently it caused some excitement as the Agwagon attempted to leave the runway. After that, the Agwagon went into the maintenance shop and emerged without the winch on its belly or the camera pod on the left wing. It flew a lot better after that. Experimental aircraft really are experimental. Weight and balance are really important. Big engines have a lot of torque. Airplanes don’t always respond the way that you might expect. A spin is a bad place to discover that airplanes don’t always respond the way that you might expect. Having plenty of altitude is a very good thing when exploring the flight envelope in an unfamiliar plane. I decided I needed to make a tandem jump to get familiar with bailing out. But that’s another story.